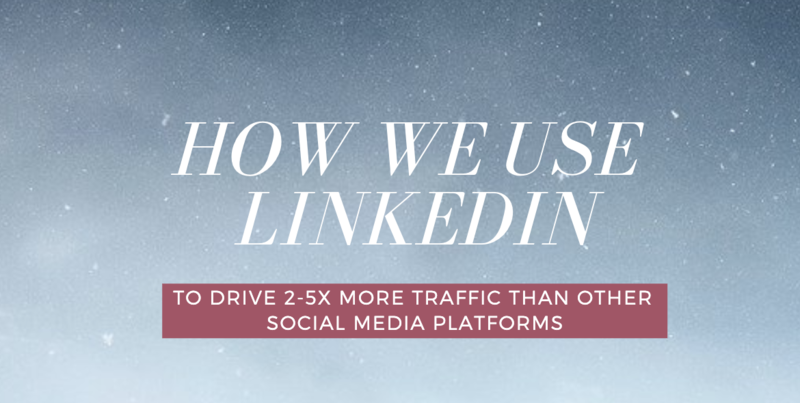 Over the past two years, we’ve heavily tested social media platforms to drive traffic. Twitter, Facebook, LinkedIn, YouTube, Quora, and more. On Twitter, the CEO of our parent company Sumo Group Noah Kagan has ~61,400 followers. That’s our biggest social media platform. 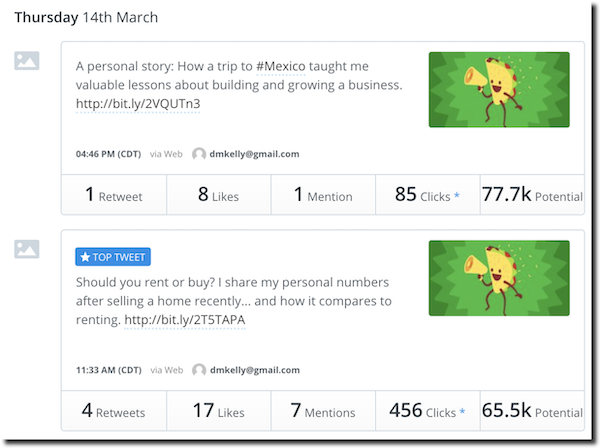 Over the past 30 days, we averaged about 156 clicks per Tweet. A few highlights of tweets over the past 30 days for Noah. On LinkedIn, we currently have 35,980 followers. But the crazy part? Despite having roughly half the following on LinkedIn, we averaged 214 clicks per LInkedIn post over the past 30 days. When we step back to the entire two-year dataset for LinkedIn, we’re averaging 243 clicks per LinkedIn post. In other words, we got 2x the results with less than half of the followers! The data of our most popular LinkedIn results over the past year. Likes highly correlate to views of the post. If you get more people to like your post, the LinkedIn algorithm will show it to more people as well. Views highly correlate to clicks. The more views you get, the more clicks you get. Likes will generate more views, and in turn views will generate more clicks. It all starts with Likes. Here’s the full data analysis for our LInkedIn. When breaking down the factors of a successful LinkedIn post that gets a lot of Likes, views, and clicks, here’s what we’ve noticed. This data is from a two-year period, so we analyzed 2,192 data points to reach this conclusion. DON’T post an image or video. We’ve heard this works for other people, but when we attach an image to a post it averages 89 clicks per post. And when we attach a video, we get 57 clicks per post (~3x less than normal). Our hypothesis is an image or video makes a post blend in with everything else. Focus on hot news or topics. Our most popular LinkedIn post over the past two years got 1,824 clicks. It about cryptocurrency, and it was posted on December 21st, 2017… two days before the crypto market crashed. The timing was a bit of luck — but we also knew crypto was a hot market in general, so we focused on it. Always put a link at the bottom. Some people will tell you to put a link in the first comment, because LinkedIn’s algorithm will rank you higher. We didn’t notice this had any impact after testing and measuring multiple times. Make your post valuable. A lot of LinkedIn posters tease all the content. Don’t overtease. It’s a jerk move to your readers… and you don’t need to for insane results. For example, in the crypto post we shared our three major lessons and still asked for a click. I recently spent $10,000 on cryptocurrency. I didn’t fully understand before I invested! I took the advice of a friend. But they have no idea about it. 1 – Easy come, easy go. ? People see the ups of crypto. But not the downs (yet). EVERYTHING comes down to earth. Back when I was running Gambit, we grew our revenue to $30 million in ONE year… and then it went down to basically $0 the next. 2 – Only invest what you can afford to lose. ? Please don’t put your life savings in Bitcoin. I use only 5% of my income (aka what I’m comfortable losing) on risky ventures like cryptocurrency. 3 – Don’t shy away from new technology + experiments. ? It might seem like I’m bashing Bitcoin. I’m not — I think cryptocurrency is something that could be around in 50 years. Explore new tech, just don’t get obsessed over it right away before you try it yourself. Leave a LIKE if you agree. ? Have you ever tried using LinkedIn before to drive traffic? How did it go?